Let's start planning your Mardi Gras party now. The Mardi Gras season begins on the twelfth day after Christmas and ends on the day before Ash Wednesday. Here in the United States, Mardi Gras was introduced by the French. It was first celebrated along the southern delta area of the Mississippi River, thus the strong connection between New Orleans and Mardi Gras. In French it actually means “Fat Tuesday”. The official celebration is always the day before Ash Wednesday, the start of Christian Lent. It falls between February 2 and March 9th. In 2016, Mardi Gras will be celebrated on Tuesday, February 9th. So you’ve got some history.. here's how to plan your celebration. A Mardi Gras party is fun for all ages. We used to host one for all the kids but it is just as much fun for adults. These party ideas can also be adapted for a masquerade party that works anytime of the year! Plan your Mardi Gras party for the weekend before Fat Tuesday. Use these awesome Feather Mardi Gras Masks from Amazon, as your invitations! Simply print up the party details and send with the mask. Then tell everyone to bring theirs to the Mardi Gras Party!! Decorations: The Mardi Gras colors are purple, gold and green so decorate with them. Crepe paper, balloons, plus great banners and hurricane cups are all fun additions that really set the tone. Add colorful tablecloths and paper goods and you will create a festive atmosphere. Mardi Gras Beads – You need to have tons of Mardi Gras beads. Bedeck your guests as the enter and hang them all over your house. Encourage the guests to adorn themselves further as they find them! Before dinner, have everyone count and the guest with the most beads wins! The inexpensive photo props below make for fun pictures of the celebration! Appetizers: Spicy crab or shrimp dip with crackers or chips. Here’s a a tasty recipe that is simple but has some Cajun kick! Dinner: A big pot of Chicken Gumbo. It is easy to make for large groups and really adds some authenticity to your party. Here’s a quick and easy Chicken and Sausage Gumbo recipe. Serve with rice and some cornbread and you are set. I happen to love the cornbread at Boston Market which tastes as good as homemade! Dessert: Tradition calls for the "King Cake". Making one was such a lengthy process, that I used to just buy one. However, one year I came across using the canned cinnamon rolls in the refrigerated section of the grocery. You know, like the Pillsbury ones! Just push them together into a ring, bake and frost. Then add the colored sprinkles! It literally took 10 minutes to make and everyone loved it so much that the following year I made 3 of them! The tradition of the KING CAKE is to bake a little "Baby King" into the cake. If you are adding the King Cake Baby King tell your guest of the tradition behind the King Cake so no one gets an unexpected baby in their mouth when they bite in! Legend says whoever gets the Baby King in their piece of the cake will have good luck for the year and some traditions crown the person as the KING of the celebration! Doubloon Hunt – You need a large supply of either gold foiled chocolate coins or Mardi Gras colored coins like these Mardi Gras Plastic Coins 100 Per Bag While you are hanging the extra Mardi Gras beads.. hide the coins and provide your guests with a Mardi Gras themed gift bag. Tell them to throw their coins in the bag as they find them. I had hundreds of them all over the place. After dinner, the person who has found the most gets a prize. It could be something good like a gift card, something creative like a t-shirt you’ve made yourself or a big light up Mardi Gras necklace! Set up a BIG BEAD Toss Table. Take 10 (12 -14 oz.) clear plastic cups, paint 3 purple, 2 green, 1 gold and leave 4 clear. Then arrange them on table in a big triangle setup,alternating the colors. Four cups form the base, then 3 cups, then 2 cups, then 1 is the tip of the triangle. Tape them to your table, add some marbles, pebbles or sand into each cup so they won’t tip over. Then paint 5 ping pong balls gold... These are your BIG BEADS!! Each guest gets 5 chances to toss. 5 points if it lands in the gold cup! Decorate some poster board and tape it to the wall to serve as a scoresheet. You sign your name and list your points at the end of your round. Best score wins a prize. You could also play co-ed teams as a means of determining the Mardi Gras King and Queen. The King gets a kiss! Crown your Mardi Gras Party King and Queen: You can also select the coronation candidates by choosing the male and female winner who found the most coins, has the most beads, came in the best costume. Purchase a crown and tiara and some special beads.. and hold a coronation! 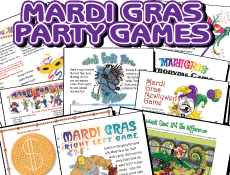 These Printable Mardi Gras Games are a fun addition to your Mardi Gras party for all ages! Buy once, keep forever. Click on the graphic to check them out!! Once Mardi Gras is over.. it's a short 40 days until Easter.. see all our Easter Celebration Ideas.. one of our favorites is creative decorations using those seasonal PEEPS marshmallow candies!